In this blog Joy MacKeith, one of Triangle’s founding Directors, explores the interplay of internal and external factors, particularly in the context of austerity in the UK, and sets out Triangle’s approach to the Outcomes Star. In the 12 years since the first version of the Outcomes Star was published, the political climate in the UK has changed dramatically; funding for services to support vulnerable people has been cut and both employment and housing are increasingly insecure. The Outcomes Star is a suite of tools which are designed to help service users and service providers work in a constructive partnership toward achieving greater well-being and self-determination. They are designed to be used in the context of an adequately funded service delivered by well trained staff. They are also rooted in the assumption that decent housing and employment are available. Increasingly in the UK these foundations are not in place and that has understandably led to anger on the part of some service users and service providers. Whilst we believe that the Outcome Star tools continue to have an important role to play in helping people to deal with the challenges they face we also recognise that personal change on its own is not enough and that addressing structural issues of poverty, poor housing, insecure employment and rising inequality are essential to creating a society in which everyone can thrive and contribute. In a climate of cuts and reduced services, some may be sceptical about the benefit of services and tools that focus on the agency of the individual. At worse it could feel like people are being asked to ‘pull themselves up by the bootstraps’ or even blamed for their difficulties without adequate recognition of the very real challenges that they face and the sense of despair that can build when the odds are stacked against you (Johnson and Pleace (2016), Friedli and Stearn(20 15)). So how do skills, habits and attitudes – the main focus of the Star, interact with opportunity and life situation? 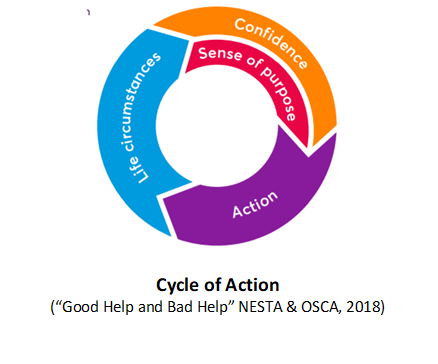 I think the Cycle of Action model presented by NESTA and OSCA in their report ‘Good help: bad help” helps to answer that question. 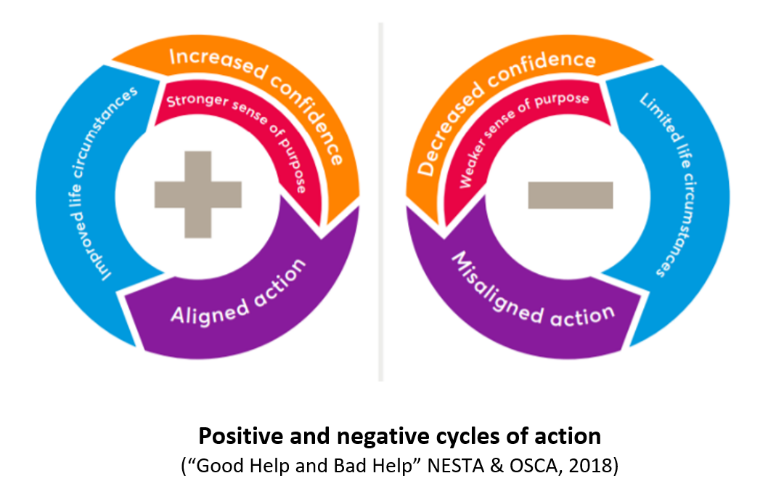 Their model draws on the ‘COM-B model’ developed by Susan Michie, Director of the Centre for Behaviour Change, University College London. It shows these internal characteristics in a dynamic interaction with a person’s life circumstances so that not only do difficult circumstances decrease confidence, purpose and ability to act, but also these internal states can also impact on outer circumstances. The implication is that those disadvantaged by difficult life circumstances such as physical or mental health issues, poverty, discrimination or homelessness are likely to also experience less confidence and ability to act and that ‘good help’ which builds these aspects is likely to positively impact on life circumstances. The report is at pains to stress that practical help is also necessary because the external barriers are very real. But the right kind of help, that which builds confidence, sense of purpose and ability to take action, can create a positive, reinforcing virtuous cycle of change. Whilst bad help does the reverse. The Outcomes Stars have always focused on the agency of the service user. For many of the original Stars, including those for use in the homelessness, mental health and family sectors, the model of change revolves around a shift from an external locus of control (“things happen to me and there’s nothing I can do”) to an internal locus of control (“I want things to be different and there are things I can do to make that happen”). However, as time has gone on, two things have happened. The first is that we have developed versions of the Star for service user groups who have less control over their circumstances, such as children or those with profound learning disabilities. The second is that the service delivery climate has become more challenging and therefore the external barriers faced by many service users have increased. For these reasons we increasingly recognise the importance of acknowledging and recording the external barriers as well as supporting the motivation and capability of the service user to overcome barriers. We do this in a number of ways including our guidance for workers on how to use the Star and in the introductions to the User Guides which are used directly with service users . The version of the Star that recognises the importance of external factors the most comprehensively within the tool scales themselves is My Star – the Outcomes Star for children in which some of the scales measure the child’s progress towards resilience and some of the scales measure the extent to which those caring for the child are providing them with what they need to thrive. Although our intention is to keep the focus of the Stars on supporting agency and ability to act, new editions of existing Stars and new versions are developed with a heightened awareness of the importance of acknowledging the external barriers. Our aim in that the Outcomes Star suite of tools enable good help, support people to manage the elements of life that are in their control and help service providers to point to the barriers that are getting in the way so that commissioners and policy makers can play their part in making change possible.